Kaziranga (India) (AFP) – Britain’s Prince William and Princess Kate jumped into a jeep on Wednesday for a wildlife safari that included feeding rhino and elephant calves, during the latest leg of their India tour. The royal couple, wearing handwoven gamochas or scarves that are traditional in India’s remote northeastern Assam state, also met wildlife officials who are battling to protect vulnerable rhinos from poachers. In their open-top jeep convoy, the Duke and Duchess, sporting sunglasses, looked relaxed as they navigated the World-Heritage listed Kaziranga National Park, home to two-thirds of the planet’s remaining one-horned rhinos. 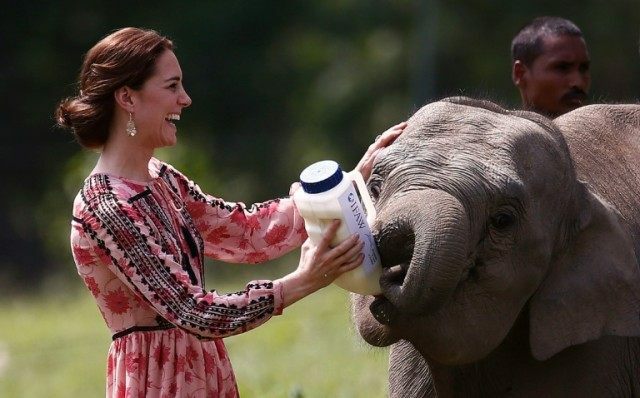 Kate, wearing a long pink and black printed dress and with giant milk bottle in hand, later fed the calves, smiling and patting them as they slurped the liquid down. “They had a lot of questions about the wildlife situation in the country,” said conservationist Rita Banerji, who met them at the park. “This visit by the royal couple will definitely help in grabbing attention of a global audience to the threats that endangered species face,” Banerji told AFP. Kaziranga has fought a sustained battle against poachers who kill the rhinos for their horns, which fetch huge prices in some Asian countries where they are used for medicines and jewellery. A recent census estimated there were 2,400 one-horned rhinos, currently listed as “vulnerable” by conservation groups, in Kaziranga out of a global population of 3,300. The couple also spoke to locals living on the edge of the forest and watched traditional weaving in one of their houses, an AFP photographer said. William and Kate are on their first official visit to India, whose 1.25 billion population has long been fascinated with the monarchy of its former colonial master. They landed in Assam late Tuesday and watched a traditional cultural dance around a bonfire, in the latest stretch of the tour that began on Sunday and has already taken them to New Delhi and Mumbai. They leave Thursday for neighbouring Bhutan, where they will meet the Himalayan nation’s king and queen and embark on a six-hour hike. The royal couple return to India to finish the tour on Saturday, visiting the famous Taj Mahal where William’s mother Princess Diana was famously photographed in 1992.